With thousands of customers encountering millions of hazards, slip and fall accidents occur at Walmart stores on a regular basis. Walmart - like any business - has a duty to inspect its premises and make them safe for customers. Store owners who fail to do so can be legally responsible (“liable”) for compensating injuries which occur as a result of their negligence. After any slip and fall accident, injury victims must protect their legal rights. Contact Gerson & Schwartz today to schedule your free consultation with an experienced personal injury lawyer. 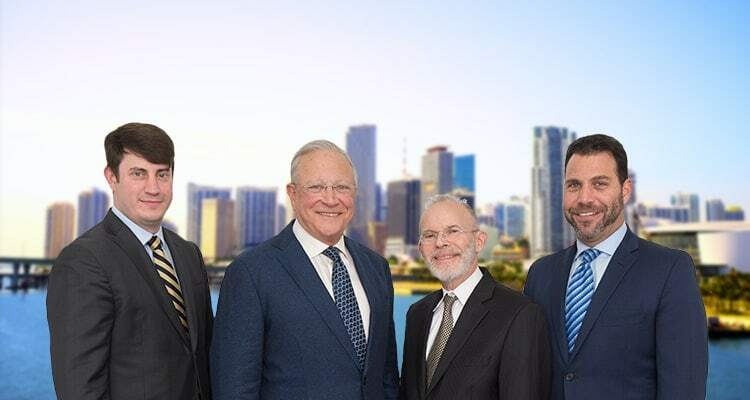 For decades, Miami accident victims have trusted Gerson & Schwartz to protect their legal interests during the difficult recovery period. Car Accidents – Accidents do not have to happen inside the store in order for Walmart to be liable. If an accident occurs on a Walmart parking lot, it may be possible for victims to recover compensation from the company. Similarly, if a Walmart employee causes an accident while performing his or her job duties, the company may be held responsible for any losses caused. Slip and Falls – Walmart stores can have slip and fall hazards around every corner. Some of the most common causes of serious slip and fall accidents in Walmarts include exposed cords and cables, wet floors, inadequate lighting, and fall hazards left in walkways. Falling Objects – Walmart stores have thousands of pieces of inventory at any given time, many that are stacked well above the store floor. When items are improperly shelved or secured, they can fall on unsuspecting customers, often causing serious injury. Some accident victims may not realize that they have a limited time in which to file a claim for compensation for their injuries. A statute of limitation is a law which helps facilitate the timely filing of lawsuits by prohibiting claims from being filed after a specified length of time. Thus, injury victims can lose their right to compensation entirely if they do not file a lawsuit within the statute of limitation. A lawsuit based upon negligence must be filed within four years from the time the plaintiff learns (or should have learned) of the negligent actions. See Florida Statutes Chapter 95.11(3). Negligence actions cover a wide array of civil claims, including: car accident cases, dog bite cases, premises liability for slip and fall cases, birth injuries, products liability, wrongful death, workplace injuries, and many more. The Florida Statutes make an exception for professional malpractice cases, such as medical malpractice, legal malpractice, architectural malpractice, accounting malpractice, and similar acts. Though these cases are also based upon the legal theory of negligence, they must be brought within two years of when the malpractice is discovered (or should have been discovered). See Chapter 95.11(4)(a). In medical malpractice, a case brought on behalf of a minor child can be filed until the child’s eighth birthday, even if it has been longer than two years since the negligence medical acts occurred. A personal injury attorney will both help you determine which statute of limitation applies to your case, and also ensure that your claim is filed before the deadline. Our personal injury lawyers represent clients injured at Walmart stores and other retail locations across Miami, Florida. Our lawyers have the skill and experience required to go up against large companies like Walmart and are committed to getting our clients the compensation they deserve. In the unfortunate event that you or someone you love has been hurt in an accident while shopping, call us today at (305) 371-6000 or email us directly about your case at info@gslawusa.com. Se Habla Español.